Extract coconut milk from grated coconut (2 cups of thick coconut milk, 3 cups of medium thick coconut milk and 4 cups of thin coconut milk). Grind jackfruit by adding a small amount of thin coconut milk. 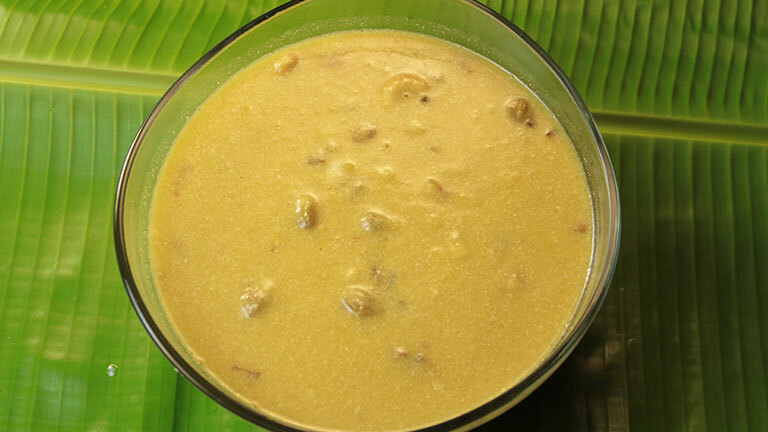 Make jaggery syrup by dissolving jaggery in boiling water and then straining it. Boil the jaggery syrup. To this add jackfruit paste, along with the remaining thin coconut milk. Sauté till it thickens, now add medium thick coconut milk and sauté. Finally add thick coconut milk and coconut bits. Mix and do not boil it.